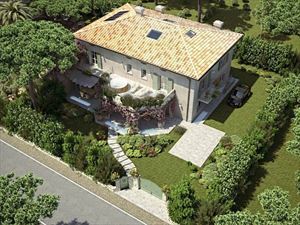 A spacious, detached villa (410 sq.m.) with a splendid garden (3000 sq.m.) and a pool (12x7 m.; 1.00-2.10 m. in depth) located in Cinquale on the border of Forte dei Marmi at 3 km from the central square, just 50 meters away from the sea. The villa is provided with air conditioning in the bedrooms, alarm system, satellite TV, Wi-Fi connection, automatic gate. The pool area is equipped with sunloungers, cabana, WC and outdoor shower. The property benefits further from a parking and barbecue area. The ground floor offers a living room, dining room, kitchen, 2 bedrooms and a bathroom. The upper floor comprises master bedroom with a bathroom with bath, double bedroom with bathroom with shower. The basement consists of SPA area with Turkish sauna, Jacuzzi, treadmill and a bathroom; living room, laundry, staff bedroom with bathroom.